White Captain in primarily black regiment; helped found American Legion; supporter of bonus marchers; later became isolationist politician; anti-new dealer; extremely anti-communist; featured in documentary "Men of Bronze". Colonel in charge of purchasing all the radio equipment for the AEF. 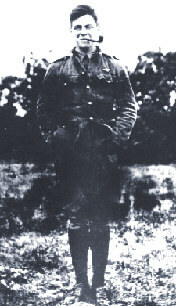 While he strictly worked in Paris, he was one of many AEF career officers to establish strong reputations during the Great War. In the Second war, he commanded V Corps for the Normandy battle and the Battle of the Bulge and Fifteenth Army during the final assault on Germany. War correspondent who lost an eye at Belleau Wood. Returned to cover later action wearing an eye-patch. Collaborated with fellow aviator Charles Nordoff on the classic "Bounty Trilogy". After transferring from the French to US air services, Hall led some of the earliest missions by AEF aircraft. Commanded destroyers stationed at Queensland, Ireland. In 1934 took flight training and became carrier commander; commanded US fleet at Leyte Gulf, Guadalcanal. Key US senior officer who commanded the 2nd Division during its Belleau Wood phase and then was given the job of re-organizing the Services of Supply which was collapsing under its own weight. Later became chairman of RCA. Stallings credits Lt. Harden with being the first wounded man in the AEF. A crusty veteran of cavalry missions in the St. Mihiel salient and in the Argonne Forest, Harmon like George Patton switched from horses to tanks. He commanded the 2nd Armored Division in North Africa and in the Battle of the Bulge in which he served with distinction. New York socialite who helped organize the Red Cross Women's Motor Corps. Later was a visible social activist and government official. Canadian who transferred to US Air Service and became an outstanding air commander. Subject of apocryphal story retold by L. Stallings. Private Helsel was among the 125 survivors of his 260 man company who returned from an attack in the Aisne-Marne sector with six bullet holes in his shirt, two in his breeches, and one in his first-aid kit. His bayonet was also shot away during the final assault. Of all the officers commissioned as 2nd Lieutenants in 1917, Clarence Heubner ended the war the highest ranking. He made Lt. Colonel in a little over a year's time. Part of this rapid advance is explained by his three Distinguished Service Crosses for valor and his DSM for leadership. In the Second World War he was commanding V Corps on VE Day. After the war, helped father expand their hotel chain to one of the world's largest. Was briefly one of Elizabeth Taylor's many fathers-in-law. Arrived in France in June 1917 as a Quartermaster Major with Pershing's orginal group of officers. By the Armisitice, 16 months later, he was a Major General commanding the III Corps in the last phase of the Meuse Argonne Offensive. Future Army Chief-of-Staff and subject of 1999 US commemorative stamp. Click here to see the 1999 issue stamp. Regular officer who won the DSM serving with a regular army division in the Great War. Commanded US First Army in European Theatre in WWII after Omar Bradley was promoted to Army Group Command. First Army took the brunt of the intital German assault at the Battle of the Bulge and was temporarily reassigned to Field Marshal Montgomery's command. Monty wanted to relieve Hodges who seemed exhausted, but Eisenhower explained that it was just Hodges's manner. Major Holcomb commanded the 2nd Battalion of the 6th Marines and went on to become the regiments Deputy Commander. Saw action in every battle of the division from Belleau Wood to the Meuse-Argonne. Served as Marine Corps Commandant until early 1944 during the Second World War. Originally assigned as an infantry officer to the 88th Division he was given duty that put the experience he had gained from the family meat packing business to use. With his commander, Lt. Hormel devised a plan for saving 40% of the space used to ship meat to Europe by boning the cuts and freezing them. He was sent home to implement the successful plan and later applied what he had learned in the AEF for the business of which he became the CEO. One such product was the GI 'favorite' of WWII, Spam. Assigned to a joint Allied operation, Lt Ingalls became the first Ace of the US Navy in less than six weeks, patrolling in his Sopwith Camel. He completed the war with 19 victories. He would become Asst. Secretary of the Navy for Air in the Hoover administration and returned to active service in World War II. Ingalls retired as a Rear Admiral in the Naval Reserve. Once known as the most difficult woman on Broadway, Elsie toured the American camps, chaperoned by her mother. Nevertheless she became "The Sweetheart of the AEF". Toured with French veteran Maurice Chevalier after the war and wrote a memoir of her experiences in France. Venerated newspaper man known for poem "Trees". Best known war poem was "Rouge Bouquet". KIA along the Ourcq River. The champion gunnery officer of the American Navy, Kimmel served aboard the battleship USS New York based at Scapa Flow with the US 6th Battle Squadron of the British Grand Fleet. Later, he would command the Pacific Fleet during the Pearl Harbor disaster. Former Hussar of the Tsar who imigrated to American where he was drafted into the American Army and rose to sergeant's rank. A reenactment center in Pennsylvania is dedicated to his memory. Served as a pilot and led first group of eightenn American's to be trained to fly Caproni Bombers in Italy. Had been elected to Congress 1916, but enlisted in 1917. Later elected to many terms as mayor of New York City. Volunteer from New York who was killed while in Paris by the German 'Paris Gun' fired from 75 miles distance. Only female American Red Cross member killed by enemy fire in the Great War. Many others, however, died in the Influenza Pandemic. Highest ranking Marine in the AEF. Major General who was the first Marine to command a full division [2nd] in combat. He became Commandant of Marines after the war and helped carve out the amphibious warfare niche for the Corps. The North Carolina Marine Base is named after him. Early advocate for American entry into the war. Served as Captain with Army Intelligence; later worked on the Fourteen Points and with the US staff at Paris peace conference; most influential journalist in America at mid-20th century. Like his fellow Harvard Class of 1918 member, Philip Carret, Love served with the AEF before beginning a remarkable business career. He went on to found Burlington Industries and become a major civic leader in his adopted state of North Carolina. First ace of Lafayette Escadrille who was later killed in action after transfering to the American Air Service. Billy Mitchell felt he would have been survived jumping from his plane [he was aiming for a pond] if he had worn a parachute. Know as the "Balloon Buster" Won Medal of Honor for shooting down 18 enemy observation balloons in September 1918. Later killed in action. Luke Air Force Base in his home state of Arizona is named after him.